All types of checks from plaid to gingham, houndstooth to tartan are major trends this fall. 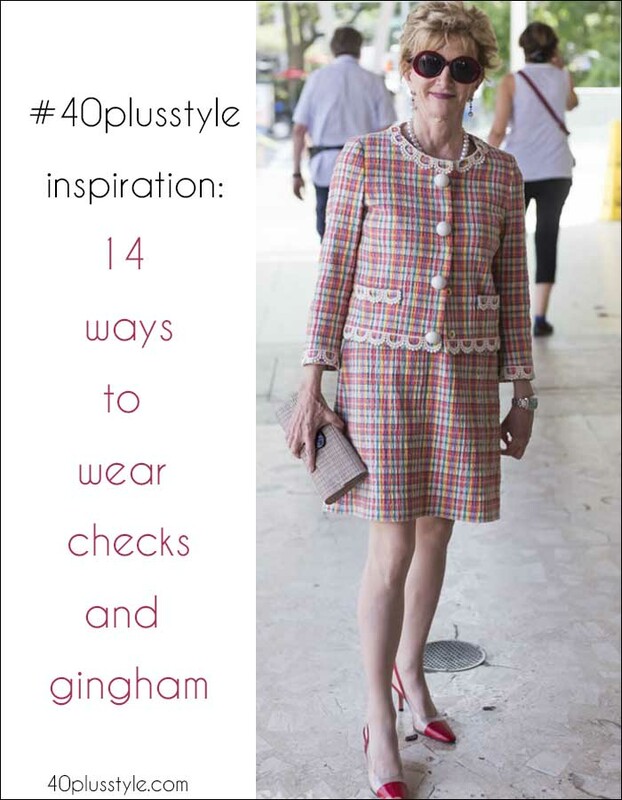 Here’s how some of the most stylish 40+ women are wearing checks this season! Which look do you like best? Lots of designers, including Chanel, Altuzarra and Balenciaga showcased checked coats on the catwalks, and the high street has followed suit with more budget-friendly options. Here, a long line double-breasted trench adds impact to an otherwise stylishly simple outfit of skinny jeans and a black top. The look is brought together with camel accessories. Showing that gingham doesn’t have to be reserved for summer. This gingham top is brought bang-up-to-date with statement sleeves. The whole look is uplifted with drop earrings and chunky black rings. 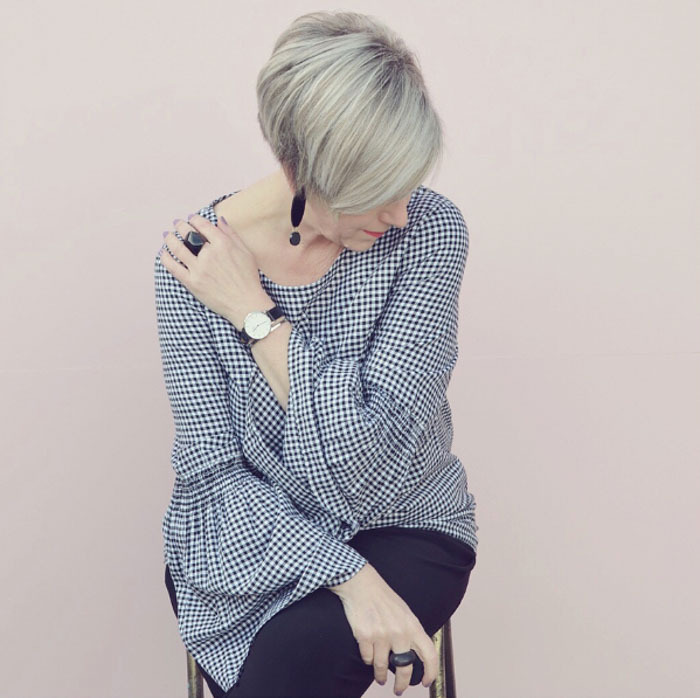 Adding statement rings to an outfit is one of 40+ stylist Ruth Essex’s 5 tips to instantly improve your style. 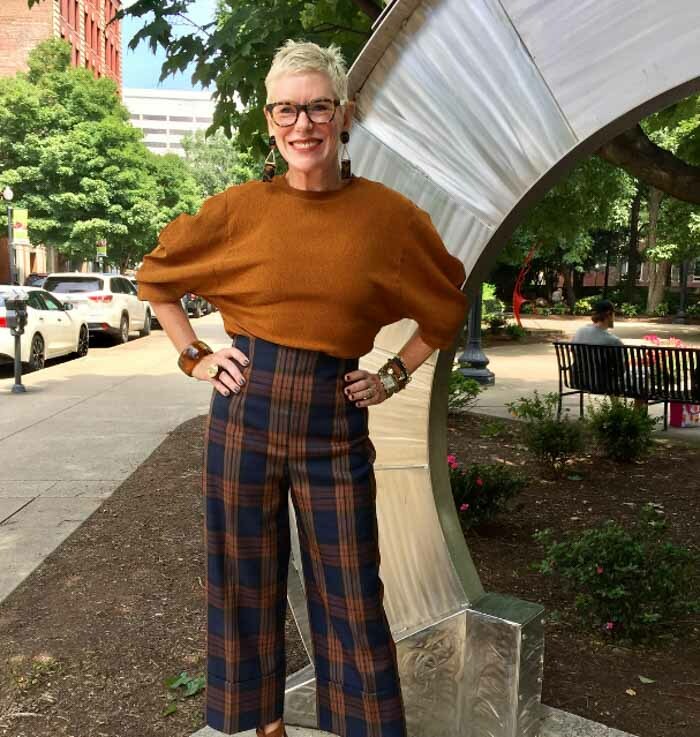 A perfect look for fall, the autumnal shade used in the sweater and checks on these pants was dubbed meerkat by the color experts at Pantone and is one of the key color trends for fall 2018. This look is brought together by the tortoiseshell in the glasses, earrings and chunky bangles. Pretty in pink, these pink pants are perfectly paired with a matching plaid shirt. With this look, the styling is all in the details. Both the pants and the sleeves of the shirt are turned up, while the shirt is left fashionably untucked on one side to show off the oversized belt. 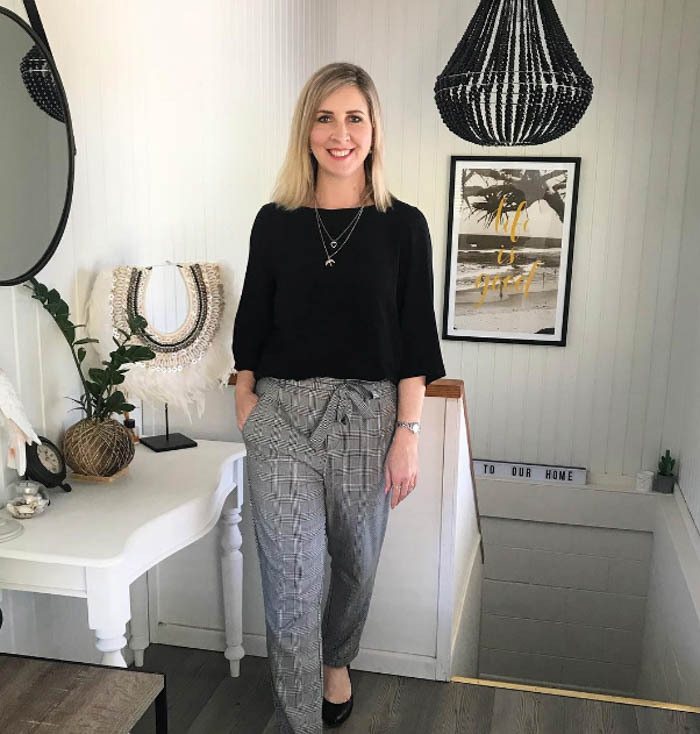 A look which could work well for smart days at the office, plaid pants are teamed with a black sweater and matching shoes, along with delicate silver jewelry. The tie-waist of the pants adds a stylish touch! These pants are a versatile buy which could be styled for any season. 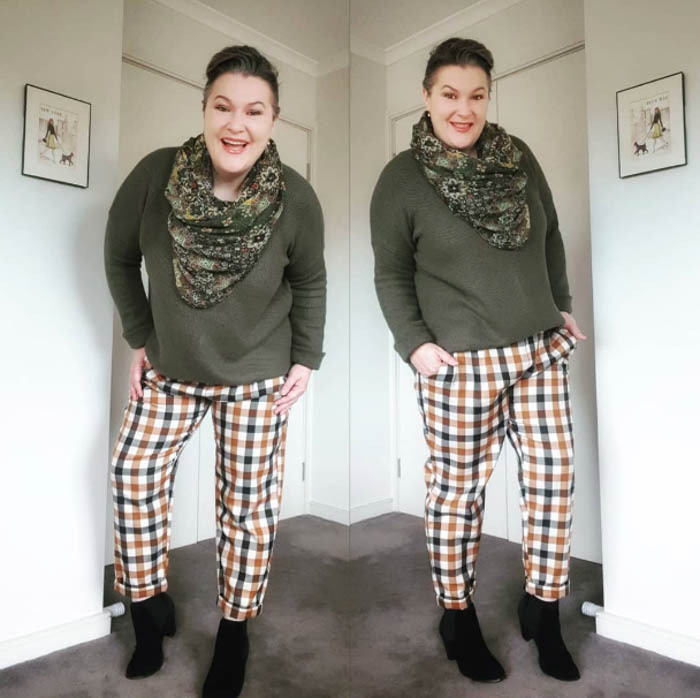 Here, they are perfect for fall, teamed with an olive sweater and a scarf which picks up both the colors in the top and the oranges in the pants. 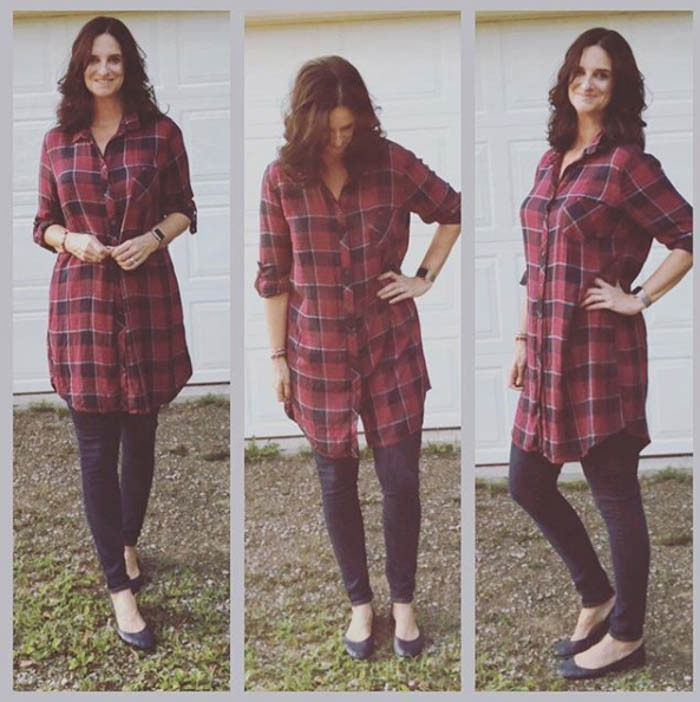 A comfy, casual look for weekends, a long plaid shirt is a great option over skinny jeans or leggings. This versatile piece could also be belted, or used as a topper rather than a duster jacket. There are more great options for wearing leggings over 40 here. Inspired by the black-and-white checks used in car racing flags, this sweater is teamed with matching, oversized bangles, and paired with statement tassel earrings. 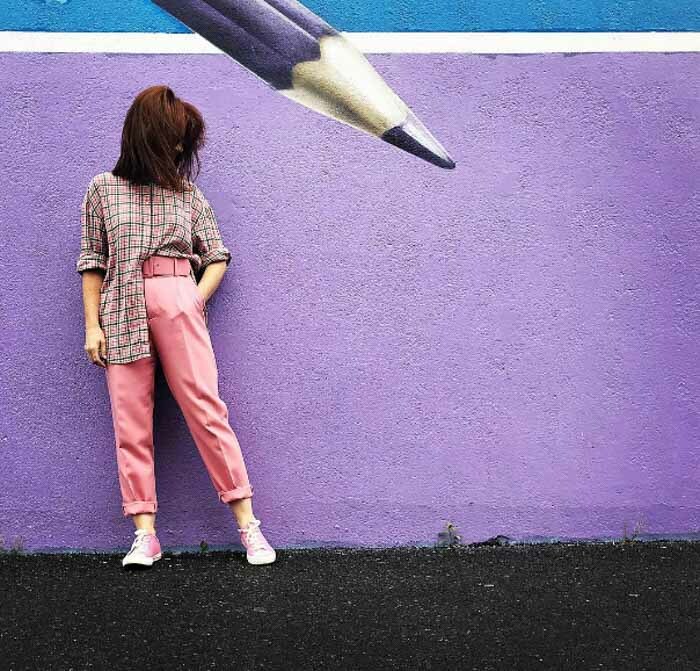 You can read about Diana Gabriel and her tips on how to make a style statement here. 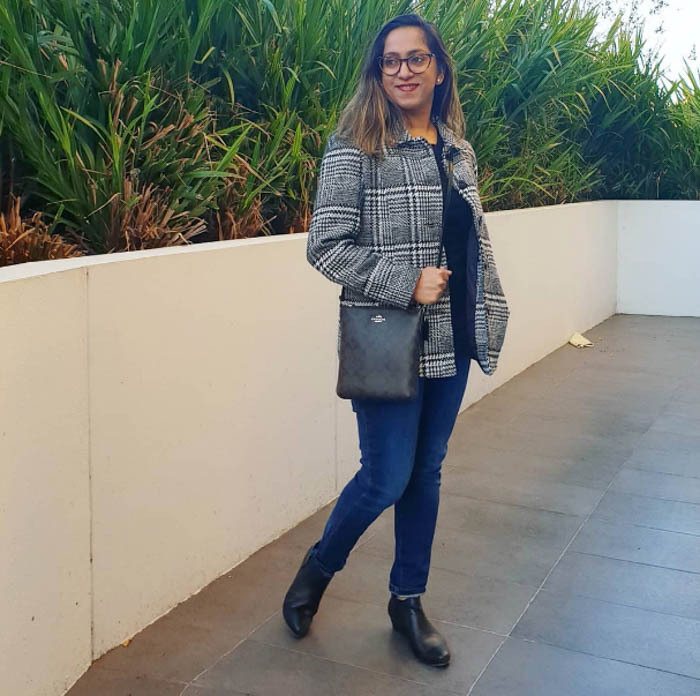 Another great casual look for weekends, this checked coat adds style to jeans and a black sweater. The look is paired with matching black booties and a crossbody bag. 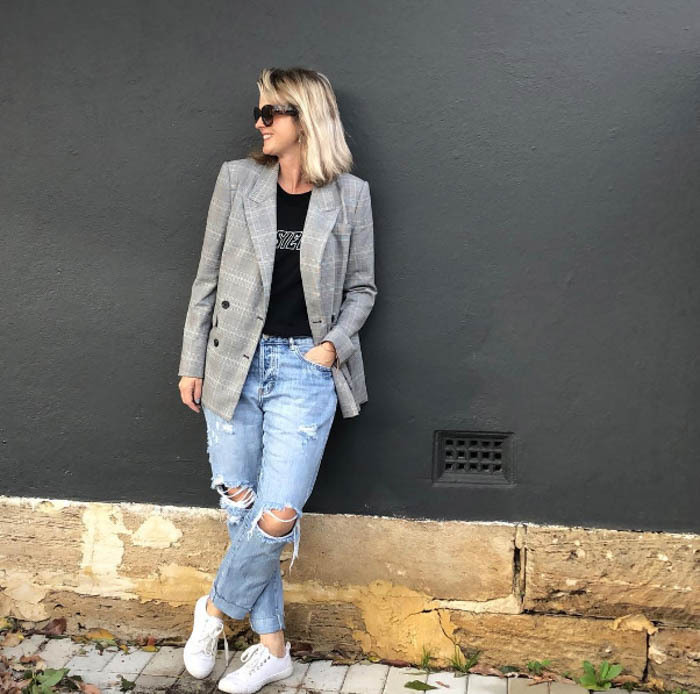 This blazer ticks off two trends in one – checks and double-breasted! It adds elegance to an otherwise casual look of ripped boyfriend jeans, a slogan tee and white sneakers. Gingham is worn here for the last weeks of summer. 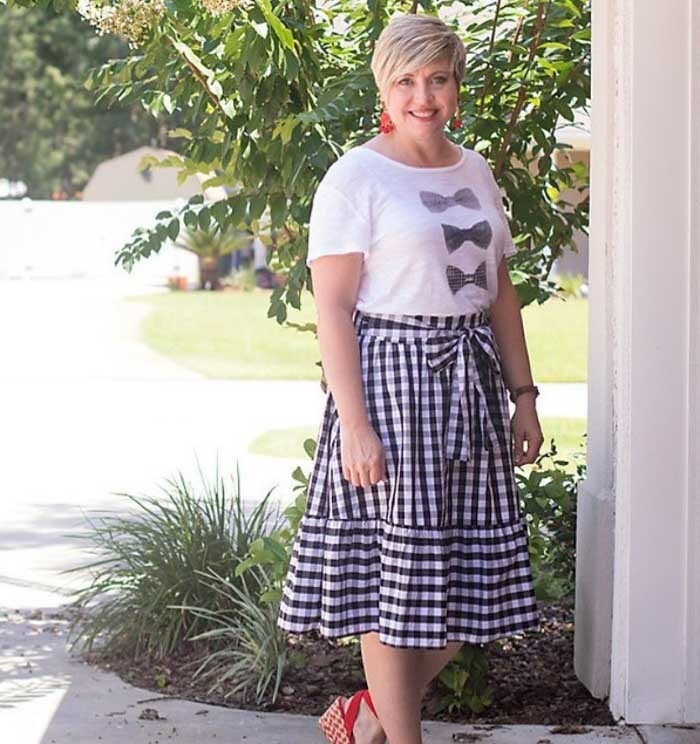 The bow detailing on the skirt’s belt is picked up with the bow motif on the tee, while shoes and earrings add a pop of color. 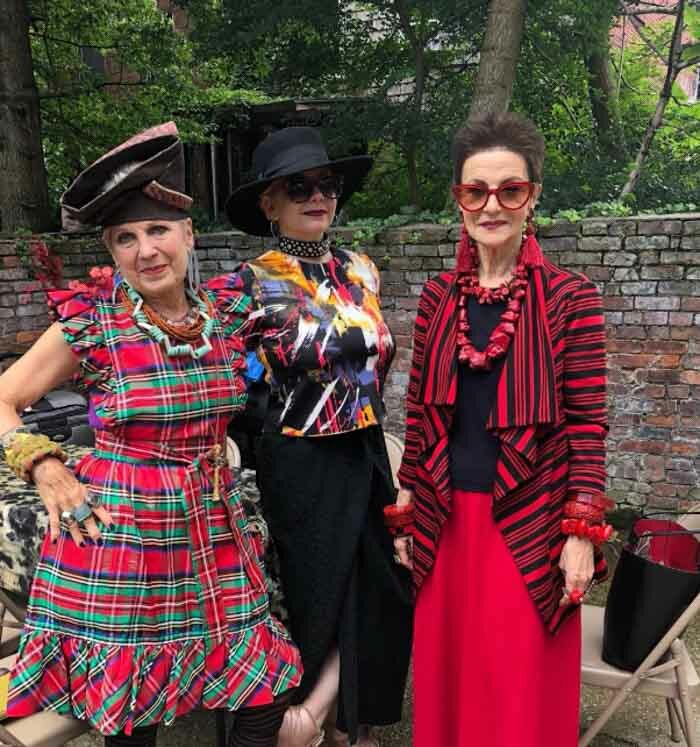 Another great photo from Gabriel, these bold looks show what fashion is all about – having fun! This time Gabriel is in stripes, while leaving the checks to a friend! The outfit on the left showcases tartan teamed with layered necklaces, rings and bracelets, and topped off with a sculptural hat. 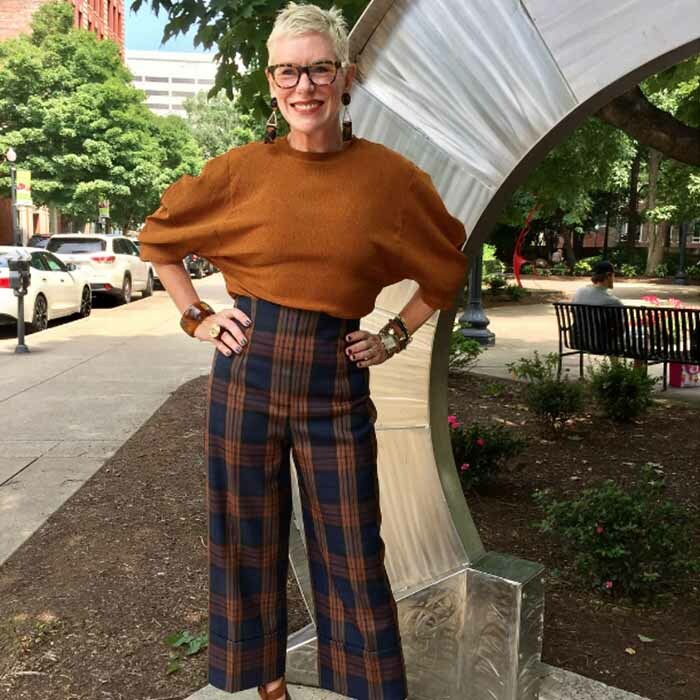 Deborah also shares eclectic style tips with us here in here style interview. Another great look for summer or vacations in warmer climes, this Bardot-style midi-dress is belted and styled with black sandals and an on-trend straw bag. 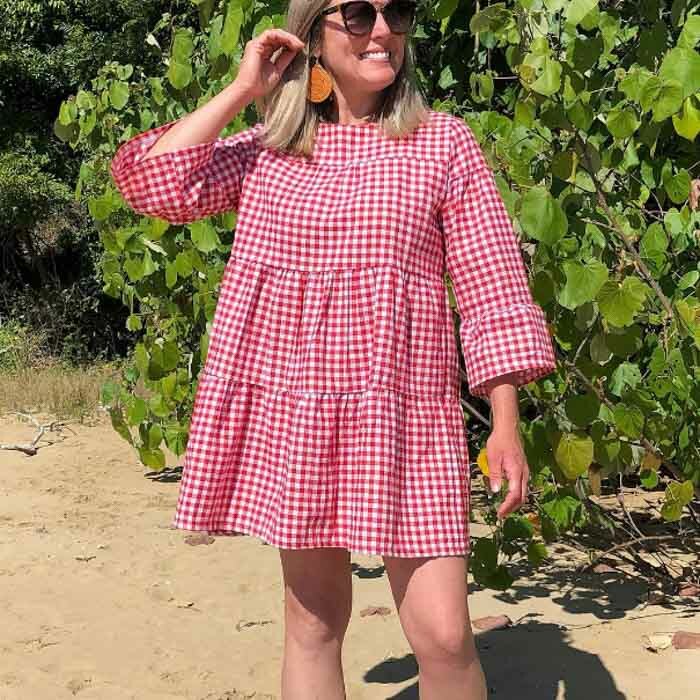 Showing that gingham doesn’t just have to be worn in black-and-white, this red dress is a great summer piece, and could also be worn as a tunic over jeans or leggings as the weather gets cooler. Oversized earrings, and, of course, a pair of sunnies finish off this look. Although I like checks and gingham I don’t have many pieces of it in my wardrobe. I find them often a bit overwhelming. I have two topsin checks and that is it I think. But I adore the outfit in the top photo. I might just come home with checks tomorrow.